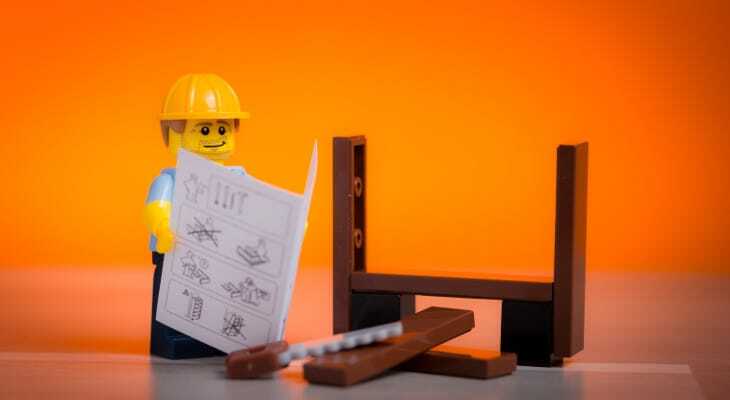 This second part will explore a simple, yet very effective approach to modularizing apps. It will cover in depth the different kinds of modules and present the benefits of this approach. This is by no means the only way to modularize an app, but it does offer some key benefits that we will touch upon later. Does it consists out of a main screen with several tabs/clickable elements? What happens when users click those elements? Chances are high that will open a new full-screen part of the app, often consisting out of several sub-screens to perform a particular action. 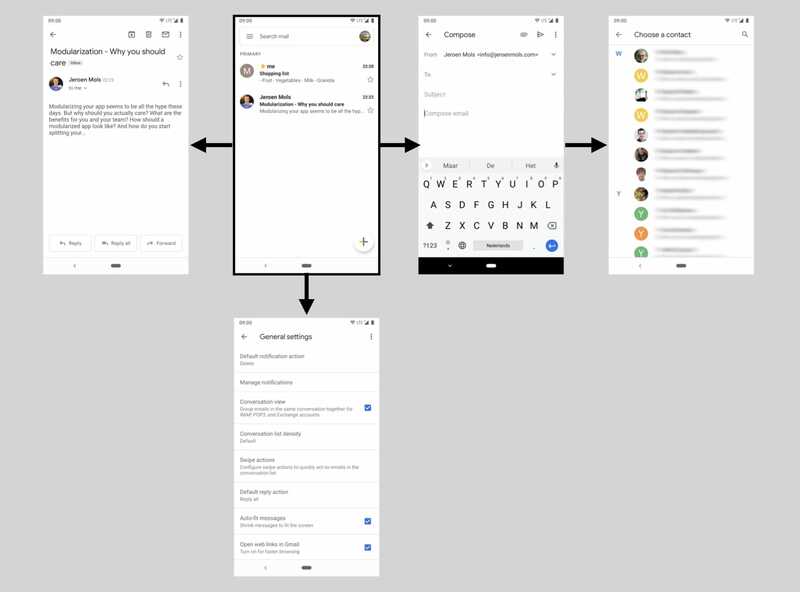 Highly simplified, apps are just a tree of (fullscreen) screens, where multiple screens often form a user flow together. Let’s call all these “user flows” features. Now let’s think about how the Android OS is designed to work: multiple apps can interact with each other via intents. This is actually pretty cool, as any app can request an action to be performed (e.g. take a picture) without having to know who will process that request and how it will be processed. The Android system simply links multiple apps together via a system of implicit intents. What if we were to take advantage of both these observations and split our app into several completely independent feature modules? Where each feature is decoupled using a simple “startActivityForResult” contract? While splitting your app into several features, all of those features will likely depend on some common business logic or UI components. Hence we need to introduce a third level of “library modules”. Features: self-contained, full-screen UI level features that include Espresso tests. Each feature consists of at least one activity and optionally a navigation graph. Feature modules never directly depend on each other. Let’s investigate these three levels in depth. Hence there is no need for very large and complex navigation controllers! 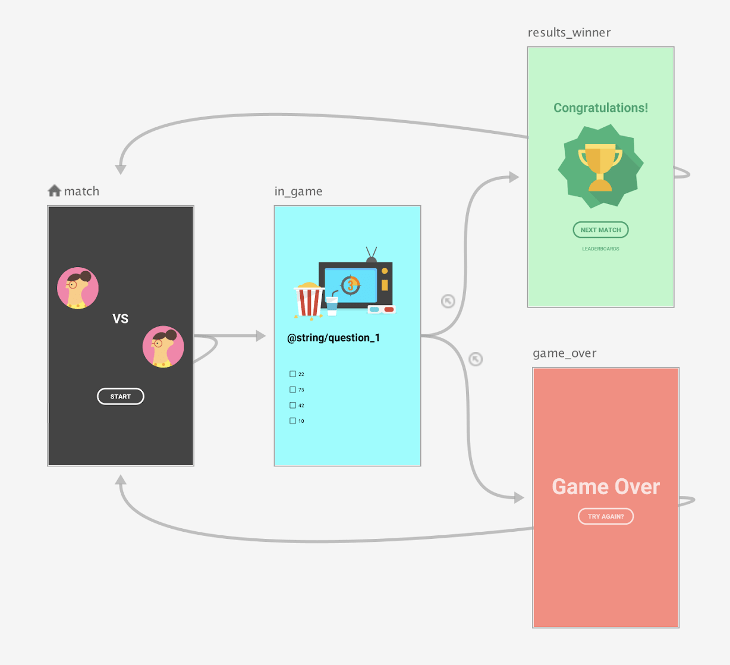 Features simply split an app in logical, coherent flows. Even more, the navigation component gives every feature a clear visual representation of its UI flow. That allows to quickly figure out what a feature does. E.g. What does the game feature do? Finally no more guessing how a particular screen was named, just jump to the right feature, look for the screen and you’ll find the fragment/views without having to guess/remember their name. Second, making features independent like this completely decouples their implementations. Hence eliminating merge conflicts across different feature teams by design! Experimenting with new technologies also becomes a lot easier: you can easily benefit from new tech end to end within a single feature. Evaluate if it’s beneficial for your team and in case of a bad choice, all effects are contained within a single modules! And should you ever decide to launch a second app (or SDK), you can simply package existing features together with new ones in a new app module. Because all features can be started directly using an intent, there is no need for Espresso to step through other parts of the app to arrive at the feature to test. This not only makes tests simpler and faster, but fewer steps also make them more reliable and tests can no longer break due to bugs in other features! 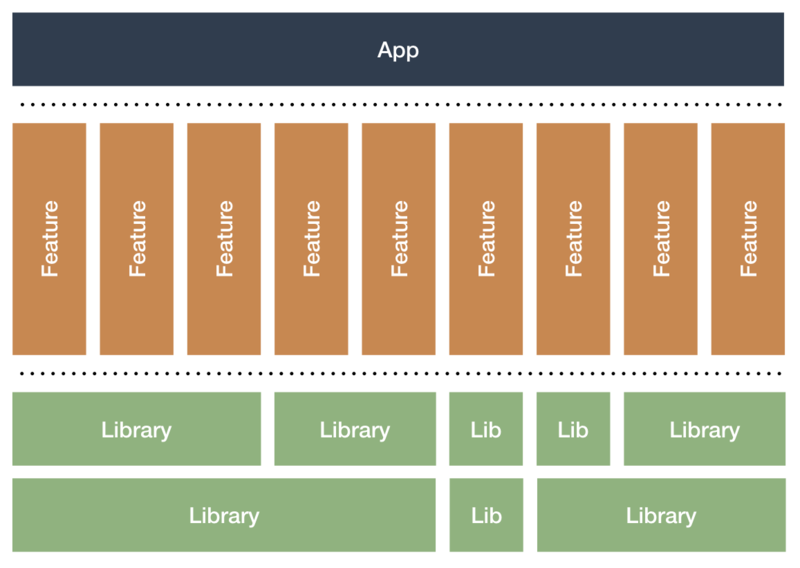 Where features are a “vertical slice” of the app, libraries are a “horizontal slice”, providing functionality to several other modules. In order to ship an app to users, something has to link all features together: the app module. In doing so the app module orchestrates the navigation from between features. It uses feature toggles to determine what should be enabled and what not. These feature toggles are incredibly powerful because by shipping multiple versions of the same feature in one app (e.g. the old and rewritten version), the app module allows to gradually roll out the rewritten feature to users. Finally, launching several apps and sharing features between them is as easy as creating a new app module. Make sure to follow me on Twitter and let’s study a detailed example of this architecture in part 3.